Due to accounting loopholes, GAAP earnings can obscure the true profitability of a business. This firm has reported many years of GAAP losses and, only recently, profits, despite generating positive and growing cash flows since 2011. With a history of cash flows exceeding GAAP earnings, a market leading position, and an undervalued stock price, Masonite International Corp (DOOR: $60/share) earns a spot in this month’s Most Attractive Stocks Model Portfolio and is this week’s Long Idea. Investors analyzing DOOR’s GAAP net income would believe that the firm was losing money until 2016, when the company first reported positive GAAP net income. When we remove accounting distortions and non-recurring charges, such as asset impairments or losses on disposal of subsidiaries, we find that DOOR’s after-tax profit (NOPAT) has been positive (and growing) each year since 2011. Since then, DOOR has grown revenue by 5% compounded annually while NOPAT has grown an impressive 73% compounded annually, per Figure 1. Accelerated NOPAT growth has been fueled by rising NOPAT margins, which have improved from <1% in 2011 to 8% in 2017. In addition to profit growth, DOOR has efficiently managed its balance sheet despite acquiring many smaller competitors over the years. Average invested capital turns, a measure of balance sheet efficiency, have increased from 1.2 in 2011 to 1.3 in 2017. Rising margins and efficient capital use have improved DOOR’s return on invested capital (ROIC) from <1% in 2011 to a 10% in 2017. The firm has also generated a cumulative $198 million (12% of market cap) in free cash flow over the past five years. Masonite International is a designer, manufacturer, and distributor of interior and exterior doors for residential and non-residential new construction and remodels. The firm’s longstanding business (founded in 1925) is now either first or second in market share in the seven product categories targeted in North America. The firm is one of only two vertically integrated molded interior residential door manufacturers and the only vertically integrated non-residential interior wood door manufacturer in North America. The firm’s largest competition comes from JELD-WEN (JELD), which is the other vertically integrated door manufacturer. Smaller competitors, which source door supplies, include Plastpro, Feather River, and Novatech. After building long-term customer relationships (each of its top 20 customers have purchased from it for at least 10 years), Masonite has focused on improving the efficiency of its business. In the past few years, it has exited unprofitable European markets, automated and optimized its production lines, implemented lean manufacturing operating systems, and created a new digital sales platform. These actions, when coupled with industry consolidation, have significantly improved DOOR’s margins. Per Figure 2, DOOR’s NOPAT margin has improved from 2% in 2017 to 8% in 2017. Meanwhile, its main competitor, JELD, has seen margins improve at a much slower pace and now lags DOOR. Higher margins provide DOOR greater flexibility to invest in plant improvements or optimize raw material procurement while remaining profitable. In a growing market, DOOR can also leverage its high margins to grow market share without completely sacrificing the bottom line. On the flip side, DOOR’s margins provide greater ability to weather a downturn in the economy, should such a scenario present itself. More importantly, in an industry dominated by two firms, DOOR’s margins insulate it in the event JELD initiated a price war. DOOR also generates greater FCF and could withstand a price war longer than its less profitable competition. It’s no secret that DOOR’s success is tied to the housing market. In 2017, residential repair and residential new construction markets accounted for 47% and 40% of sales, respectively. Bears argue that the market has peaked and will only decline from its current point. Were this the case, DOOR’s end markets would experience falling demand, which would lead to lowered revenues and a likely decline in profits. However, macro-economic data contradicts this view of the housing market. Despite month-to-month fluctuations, the United States housing market (which accounted for 66% of revenue in 2017) remains strong and has room for further expansion. New home construction still remains well below historical averages, and remodel/repair activity continues to trend upwards. Figure 3 shows that annual new home sales remain well below the average of any 10-year period since the 1960s. 2017 annualized sales of 617 thousand remain 11% below the 30-year average. Even if we look at the 30-year period prior to the 2000 housing bubble, 2017 sales still remain 5% below the 1970-1999 average. New home starts, which include homes that haven’t completed the sale process yet, also remain below historical averages. From 1987-2017, new home starts averaged 1 million per year. Over the past decade, new home starts averaged 612 thousand per year. After picking up in recent years, the 5-year average of 723 thousand new home starts is still 29% below the 30-year average. The housing market index (HMI), a survey of single-family housing market conditions, remained at 70 in March 2018, which marks 45 consecutive months above 50. A reading above 50 indicates positive sentiment given the current market. Apart from new home construction, the Remodeling Market Index (RMI), created by the National Association of Homebuilders (NAHB), provides insights on current remodeling market conditions. At the end of 2017, the RMI reached 60 for just the second time since 2001. Any reading above 50 indicates that remodeling activity is higher compared to the prior period. The RMI has been at or above 50 for 19 consecutive quarters. The leading indicator of remodeling activity (LIRA), released by the Joint Center for Housing Studies of Harvard University, projects that homeowner spending on improvements and repairs will grow nearly 8% year-over-year in 2018. The Joint Center for Housing Studies believes 2018 could post the strongest gains for home remodeling in more than a decade. Similar to the HMI above, the RMI future market measurement would also indicate a strengthening remodeling market. The RMI future indicator was 59 at the end of 2017, which is up from 52 in 4Q16. One final issue from bears is DOOR’s revenue concentration. The Home Depot (HD) accounted for 18% of DOOR’s 2017 sales. Such concentration would be more concerning if it were based on one individual product or geographic locale. Instead, DOOR sells multiple different products across the country via Home Depot, which increases Home Depot’s switching costs were it to remove DOOR products from its sales floor. Additionally, Home Depot is a well-run retailer (grown NOPAT 7% compounded annually over past decade), which minimizes the threat of a large distribution center going bankrupt, as we’ve recently seen with Toys R Us and toy manufacturers. The bear case is further weakened by DOOR’s valuation. Not only does the stock look cheap when analyzed against peers, but the stock’s valuation also implies profit growth will cease moving forward, as we’ll show below. Per Figure 4, ROIC explains 81% of the difference in valuation for the 21 Construction Supplies & Fixture stocks under our coverage. DOOR’s stock trades at a significant discount to peers as shown by its position below the trend line in Figure 4. 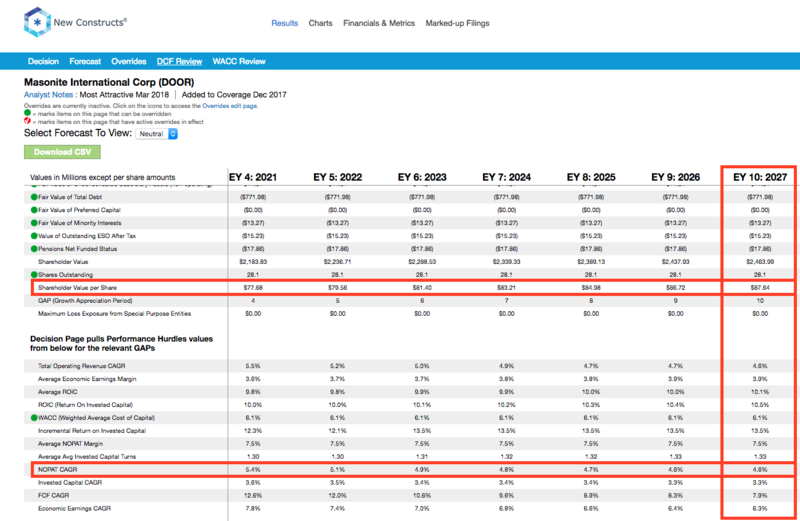 DOOR’s enterprise value per invested capital (a cleaner version of price to book) of 1.5 implies that the market expects its ROIC to decline to 7%. If the stock were to trade at parity with its peers, it would be worth $97/share – a 62% upside to the current stock price. Given the firm’s improving margins and ROIC, one would think the stock would garner a premium valuation. Below we’ll use our DCF model to quantify just how high shares could rise assuming conservative profit growth. Despite the strong fundamentals, DOOR is down 19% year-to-date, with half that decline coming after DOOR missed earnings expectations in February. Over the same time, the S&P is down just 1%. This decline in valuation leaves DOOR significantly undervalued, both by traditional metrics and when analyzing the expectations baked into the stock price. DOOR’s P/E ratio of 11.8 is below the Consumer Cyclicals sector average of 20.7 and the S&P 500 average of 24.9. When we analyze the cash flow expectations baked into the stock price, we also find that DOOR holds significant upside potential. At its current price of $60/share, DOOR has a price-to-economic book value (PEBV) ratio of 1.0. This ratio means the market expects DOOR’s NOPAT to never meaningfully grow from current levels. This expectation seems overly pessimistic for a firm that has consistently grown NOPAT significantly since 2011. If DOOR can simply maintain 2017 NOPAT margins of 8% and grow NOPAT by just 5% compounded annually for the next decade, the stock is worth $88/share today – a 47% upside. Given the continued growth in the housing market, such a scenario could prove conservative. Should DOOR’s margins improve as they have in years past while revenue growth continues, the stock would hold even greater upside potential. Masonite continues to invest in optimization and automation in its production facilities that we expect will drive further margin improvement. At the end of 4Q17, the company had reduced employee headcount and optimized scheduling to remove less productive shifts. The company updated plant layouts to increase efficiency and also invested in automation and robotics to increase capacity without increasing labor requirements. Management has also noted that factory productivity and distribution are the top operational priorities in 2018. With future cost savings, DOOR could be setting itself up for another multi-year run of profit growth, which should propel shares higher. In the meantime, investors receive significant yield even in the absence of a dividend, as we’ll show below. Combined with favorable outlook for a growing market, as detailed above, the company’s efficiency improvements should drive profit growth that significantly exceeds the market’s low expectations. DOOR does not pay a dividend but, instead, returns capital to shareholders through share repurchases. In February 2017, the company authorized an additional $200 million in share repurchases, of which $121 million remain as of December 31, 2017. In 2016 and 2017, DOOR repurchased $109 million and $120 million worth of shares, respectively. If DOOR management purchased shares in line with the averages of the past two years, it would repurchase $115 million over the next year. A repurchase of this size equates to 7.0% of the current market cap. DOOR’s executive compensation plan, which includes base salary, annual incentives, and long-term incentives, is based on reaching target financial goals. Annual incentive goals include net revenue and adjusted EBITDA. Long-term incentives are awarded via stock options and performance-based shares. Performance share goals include adjusted EBITDA and return on assets. Non-GAAP metrics such as adjusted EBITDA provide management significant leeway in calculation and could lead to executives receiving bonuses while destroying shareholder value. We would prefer to see executive compensation tied directly to value creation, specifically tied to ROIC, since there is a strong correlation between improving ROIC and increasing shareholder value. Despite the use of metrics not directly tied to increasing shareholder value, DOORs current exec comp plan has not led to executives getting paid while destroying shareholder value. The company has improved economic earnings, the true cash flows of the business, from -$57 million in 2011 to $54 million in 2017.
Insider activity has been minimal over the past twelve months with 115 thousand shares purchased and 78 thousand shares sold for a net effect of 37 thousand shares purchased. These purchases represent less than 1% of shares outstanding. There are currently 742 thousand shares sold short, which equates to 3% of shares outstanding and 2 days to cover. Short interest has increased 36% from the prior month which matches the pessimistic expectations baked into the stock price. Income Statement: we made $102 million of adjustments, with a net effect of removing $2 million in non-operating expense (<1% of revenue). We removed $50 million in non-operating income and $52 million in non-operating expenses. 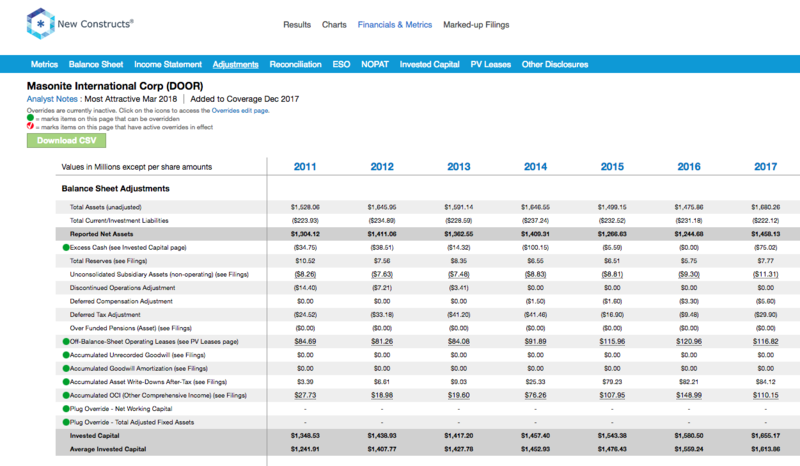 You can see all the adjustments made to DOOR’s income statement here. Balance Sheet: we made $482 million of adjustments to calculate invested capital with a net increase of $156 million. The most notable adjustment was $117 million in operating leases. This adjustment represented 8% of reported net assets. You can see all the adjustments made to DOOR’s balance sheet here. Valuation: we made $935 million of adjustments with a net effect of decreasing shareholder value by $763 million. Apart from $772 million in total debt, which includes $117 million in operating leases noted above, the largest adjustment to shareholder value was $75 million in excess cash. This cash adjustment represents 5% of DOOR’s market cap. Despite the decrease in shareholder value, DOOR remains undervalued. The following fund receives our Attractive-or-better rating and allocates significantly to Masonite International. Fidelity Select Construction and Housing Portfolio (FSHOX) – 1.0% allocation and Attractive rating. This article originally published on March 28, 2018.